The treadmill is often a staple in many exercise routines. Treadmills offer a practical venue to stay consistent with a cardio program no matter what the weather may be outside. The treadmill operates by using a motor to rotate a cylinder which in turn rotates a rubber tread around in a continuous loop allowing the user to simulate running without actually going anywhere. 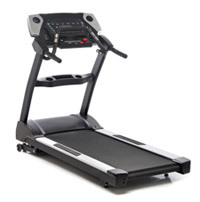 Treadmills are not only popular in gyms but many people also purchase treadmills for home use (if you decide to purchase one for home use, be cautious, treadmills can be quite heavy because of the motor used to turn the tread). When deciding where to put the machine, be sure it has good ventilation as you will get warm when exercising on it. Optimize your workout further by reading more about cardio exercises. Additionally, the treadmill is a great place to start if you're looking to burn away excess fat and get a 6-pack. Couple this with lower ab exercises and you'll have a great workout combination.